Canadian Thanksgiving has come and gone and we’re now gearing up for the Christmas holidays. But for my American readers, Thanksgiving is around the corner and if you’re looking for an alternative to your typical roast turkey, I’ve got the perfect solution for you! 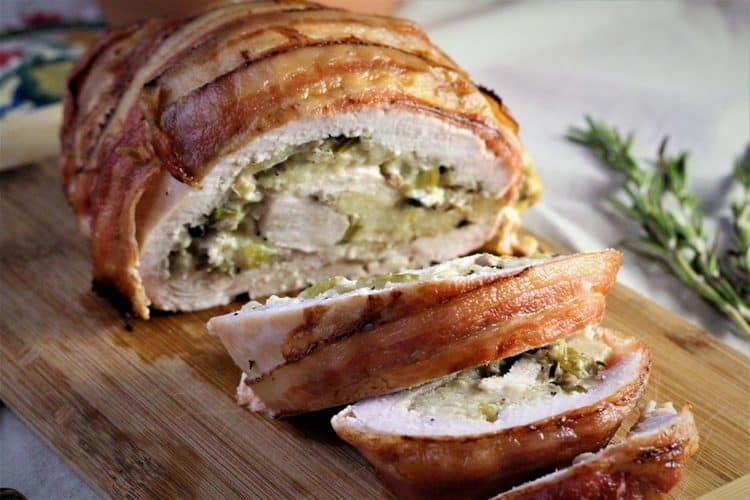 I recently taught this Bacon Covered Turkey Roulade with Mushroom Filling at a cooking class and it was a huge hit! Since then I have received several requests for the recipe so here it is. I was initially inspired by a recipe of Emeril Lagase’s when I was considering a turkey roulade recipe for an upcoming Thanksgiving class. We all know when it comes to Emeril, pork fat always rules! But, as much as I like bacon I felt it was overkill to both cover and fill the roulade with bacon. I also decided to “Italianize” the recipe by adding two different cheeses as well as rosemary to the mushroom filling. I found it easier to work with two smaller turkey breasts rather than one large one, so I opted for two approximate 1.5 lb pieces. The result was a crowd winning combination and when we sliced it up at my recent cooking class, the reaction was priceless! Several of my students were complaining that their turkey turns out dry or that they were not entertaining large crowds and did not want to put up with turkey leftovers for a week. That’s why this turkey roulade is the perfect solution. Despite the fancy look it is a breeze to put together. If you find any imperfections such as tears in the turkey breast when rolling it up, no worries. You then cover it up with those slices of bacon, and it looks perfect. Just look at this photo! Of course, I tested out this dish on my toughest critics before teaching the recipe. You may know them as my kids. And, of course, they immediately approved. Then again they’ll approve of anything covered in bacon. 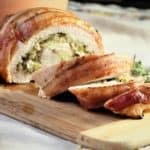 So, whether it is for the upcoming American Thanksgiving or the holiday season, consider serving this roulade and be prepared to be showered with praise! 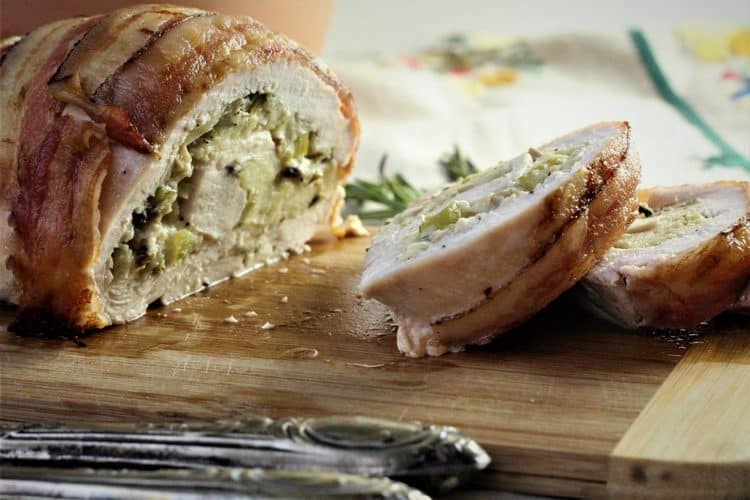 This turkey roulade is the perfect alternative to your traditional Thanksgiving turkey. Filled with a savoury mushroom filling and covered with bacon slices to keep it juicy and moist, it's sure to be a winner at your next gathering. Preheat oven to 400 F. Place turkey, skinned side up, on a cutting board. Holding a sharp knife parallel to the board, cut the turkey almost completely in half without cutting all the way through; open like a book. With a meat mallet, pound turkey to a 1/2-inch thickness. Sprinkle with salt and pepper. Set aside. In a large bowl, toss bread with milk; set aside. 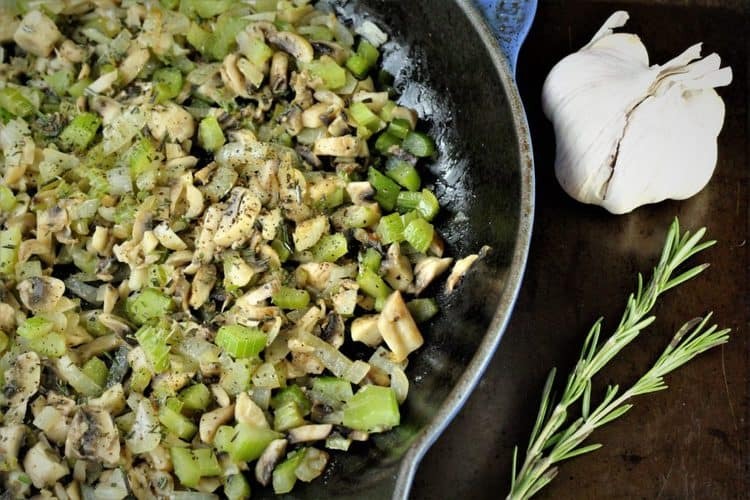 In a large skillet add onion and celery; cook until softened, about 5 minutes. Add garlic, cook for 2 minutes. Add mushrooms and cook until they have released their liquid, about 5 minutes. Add wine; cook until evaporated from 2 to 3 minutes. Stir in the rosemary. Pour into a bowl and allow to cool to room temperature, about 10 minutes. Squeeze excess milk from bread and add to bowl with mushroom mixture. Add eggs, cheeses, 1 teaspoon salt, and 1/2 teaspoon pepper; mix well. Spread stuffing on turkey breast, leaving a 1/2-inch border all around. Starting at a short end, roll turkey over stuffing, tucking in the ends to form a log. Place turkey roulade, seam side down, on a baking sheet. 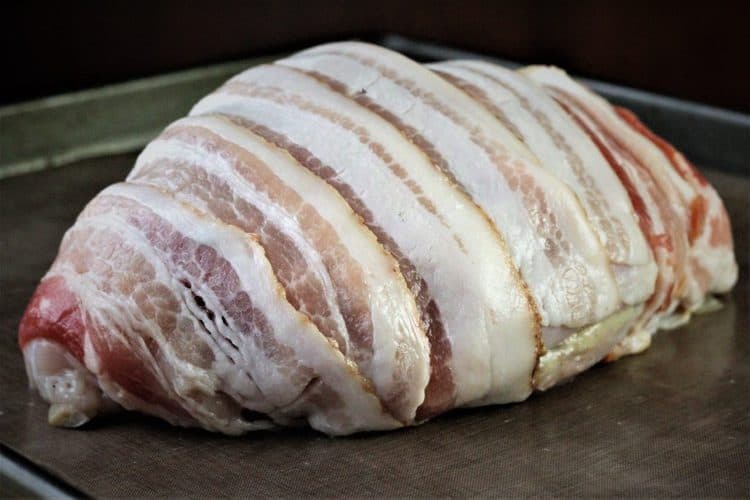 Slice bacon slices in half and place crosswise over turkey, overlapping slices slightly. Tuck the ends under the roast. Roast between 45 minutes to 1 hour until the internal temperature registers 165F. Let rest for a few minutes; slice and serve. Thank you! Hope you give it a try! Thanks for stopping by my blog, it’s quite tasty! Is this recipe able to be made ahead? Say the day before? Hi Amy, I have actually assembled it the day before and then baked it right before serving. Thanks for your question!